Patricia Watson is the owner and founder of Aberdeen’s newest Yoga Studio – BARE FOOT and TWISTED. She has practiced yoga for 8 years and loves the strength, flexibility and focus that yoga develops. A qualified accountant and business owner, she decided in 2017 that she would like to step away from the desk job and train as a yoga teacher and open a studio. She believes that yoga can make people feel confident and comfortable in their own skin and that that translates from the mat to normal life. Being qualified in sport and remedial massage and medical acupuncture she has a keen interest in anatomy and in particular, variable anatomy, which underlies her teaching. In 2017 she completed her 200 hour YTT and registered with Yoga Alliance. She also trained as an aerial yoga teacher and completed 100 hours of yin YTT. 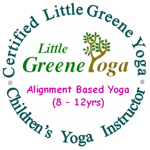 As a mother of four, her children have all been around yoga growing up and have enjoyed practicing. With this in mind, Patricia decided to train as a children’s yoga teacher to be able to teach yoga to children in a way that is accessible and fun, with a highlight of safety and development. 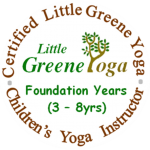 Trish successfully completed her Little Greene Yoga Foundation Teacher Certificate (3-8 yrs) in February 2018 and her Little Greene Yoga Alignment Based 8-12yr Teacher Certificate in March 2018. Children’s Yoga Classes will be available as part of the Bare Foot and Twisted Yoga Studio timetable.